My bottle(s) of Islena come from my sister-in-law, Jess – who always seems to bring a welcome couple with her whenever she comes to visit. She lives in Ibiza full-time; and as far as I can fathom is loving it like that* 24 hours a day 7 days a week. First off – the bottle. It’s made of aluminium yet it is still a crown capped bottle, could this be the way to get around the UK drinkers dislike of cans? 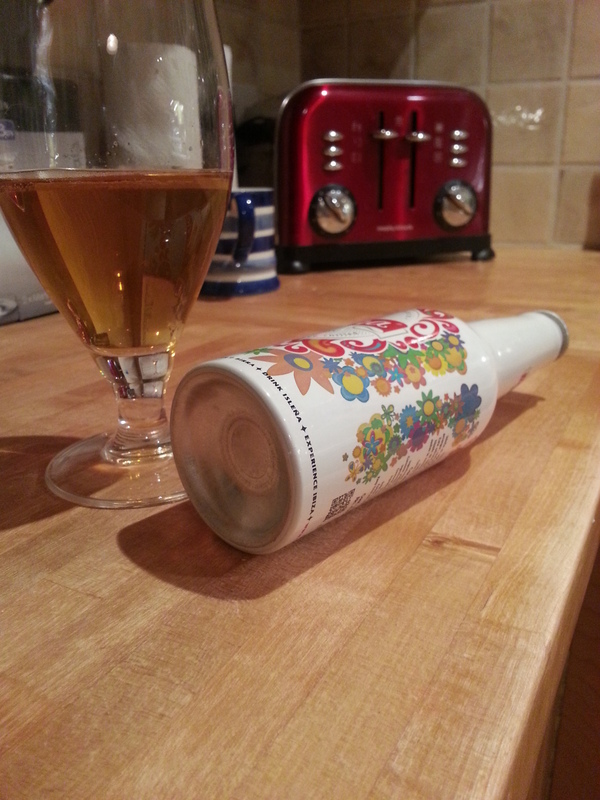 I’m willing to bet that someone will start whacking craft beer into bottles like this soon. It’s a sure fire winner as far as I’m concerned. 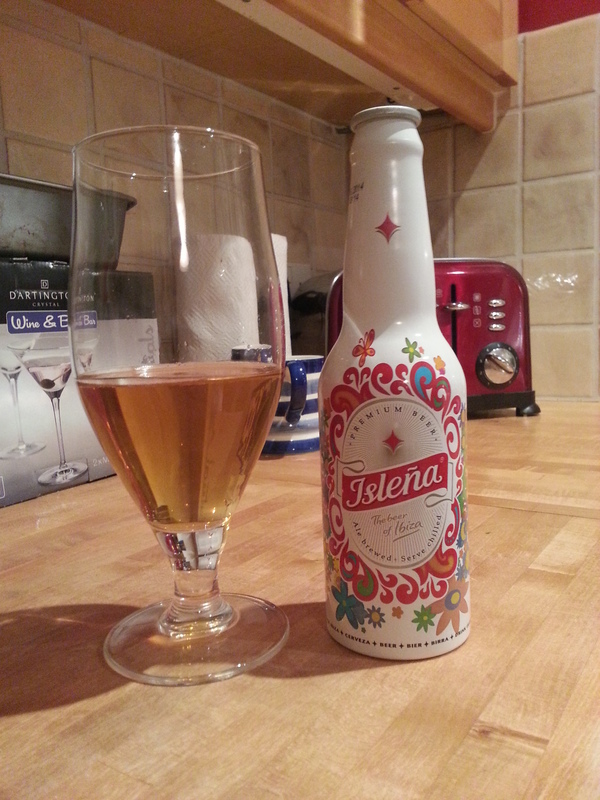 As it states on the website: this is the beer of Ibiza and Ibiza is lucky to have it as it’s a fairly respectable drop – especially when drunk in context: i.e. coolish and in baking weather. Straw gold it’s a pretty little drop and the aroma is honeyed and enticing. There’s some background malt and minerals – but mainly it reminds me of Ron Miel (Honey Rum) and this is good. The taste is sweet and refreshing, with a little fruitiness that rides atop it. The after-taste is surprisingly long-lasting and is all malt and refreshing sweetness with a tiny touch of bitter on the back edge. It can’t have been more than a couple of few weeks back since I took a look at Cliff Quay’s Sea Dog – which I enjoyed enormously. 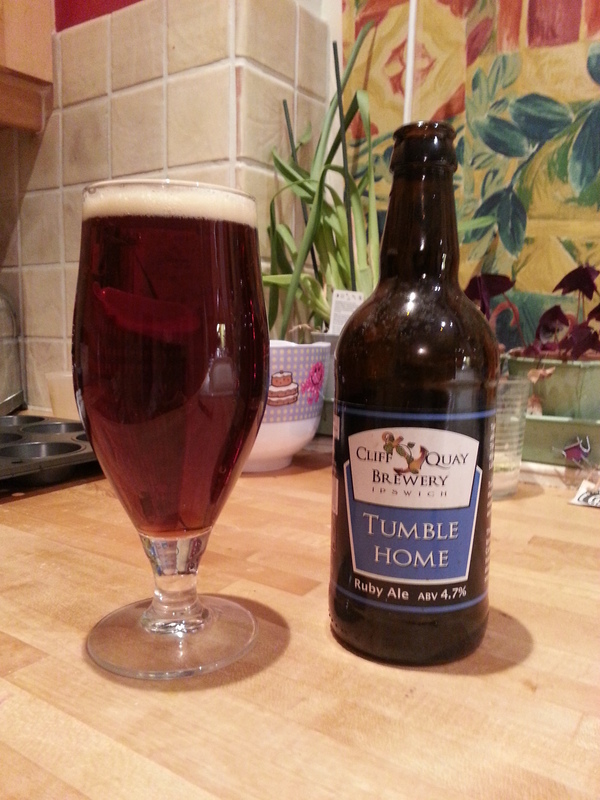 Well now it’s the turn of Tumble Home, a beer that’s very aptly named given it’s 4.7% strength; it’s just one of those beers that’s easy to drink and easy to get drunk on. A lovely ruby brown (if you can imagine such a colour – maybe more a russett?) with a tan head that hangs about before fizzling off for islands, foamy. On the nose it’s good solid malts with overtones of fruitiness and a light sherry-ish kind of edge – I’d definitely put this one in the autumn beer category. The taste follows a solid carbonation, and is both sweet and dry in the body with autumn fruits, some woody twangs, a bit of old leather and a lovely dry woody fruity finish. The after-taste is like polished wood in the air, bookish, antique-y with lots and lots of lovely warming alcohol. Look at the label: that Franciscan monk looks suitably pleased with himself – and he should do: as far as he’s concerned he’s got God on his side and he gets to drink this lovely beer. Out it came and into the glass, a slightly muted orangey colour with plently of hefe haze. 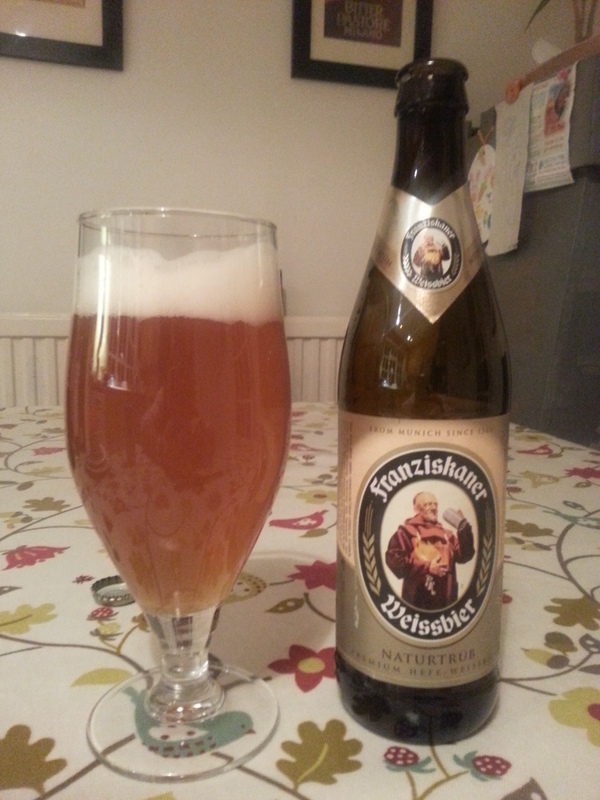 As with all beers containing wheat, Franziskaner had a huge dollop of fluffy snow-white head. Before the taste there was the vigorous carbonation – typical of Weissbier style, which slowly dissipates to reveal a nice up-front spiciness, followed by smooth banana creaminess and then a really nice spicy-prickly dry note that persists for an astonishing amount time. I must confess that I’m not usually a beer kit type of brewer – preferring to make up my own recipes (for better or worse). Jim and Sarah bought me a Dark Star Festival Ale kit from dear old http://www.brewuk.co.uk (along with another – to follow) so on Sunday Jim and I brewed it up. We sparged the malt pipe with 4 or so litres of 78C water – giving a pre-boil volume of 27 Litres. 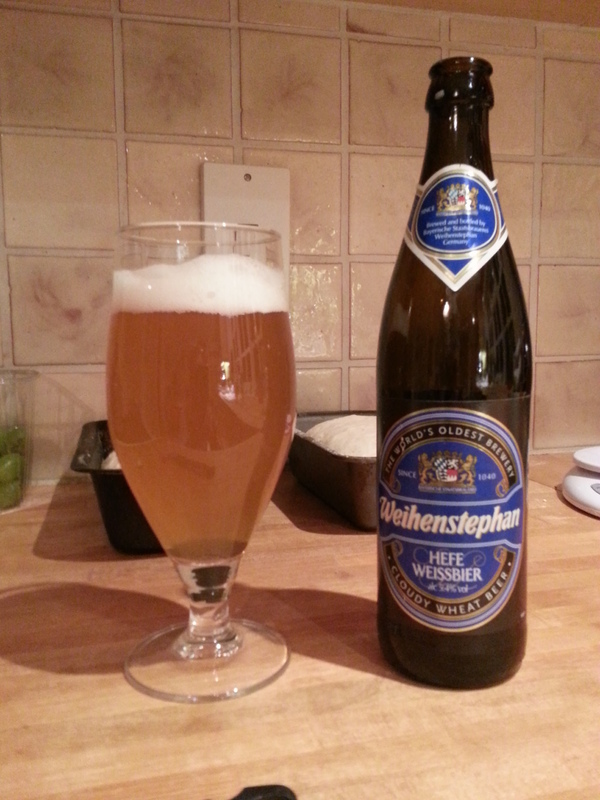 Anyway: Weihenstephaner Hefe Weissbier – what a lovely, lovely, lovely beer. Arriving a really gorgeous, almost luminous hazy orange colour and sporting the snowiest caps – this beer is a joy to behold. The aroma is deliciously tempting: being all yeastily-complex with graininess from the wheat, some bubble-gummy notes and a delicate spicy edge. In the mouth it’s highly carbonated – that, after a short while, dissolves away leaving a soft and creamy cranachan-like mouth-feel, upon which a beautiful spicy sweetness plays out. Wheat beer in my opinion is all about the mouth-feel – you just can’t get that with barley malt alone – and it serves as a great back-drop for all the other flavours; it’s such a great ingredient for this feeling of sumptuous, velvety indulgence. After the swallow, spiciness fizzes and pops on the tongue before a blanket of creaminess comes down once again – bringing gentle cloves and banana at the very end. Refreshing and silky smooth, this in one hell of beer: easy and joyous to drink – but do take the time to appreciate the breadth and depth of its complexity…as you pour literally gallons of it down your neck. I know some folks load up their wheats, weiss and wits with some orange peel and sometimes a smidge of coriander seed – but a “brown” beer with Orange peel in it? That’s just got to be mad, hasn’t it? Orange Peel beer is nicely carbonated and the colour of slightly-more-wholesome-looking Irn Bru. The aroma is yeastily fruity and big on the malt, I can’t detect a strong orange aroma, but it’s obviously there and is well-meshed into the overall hops and malt theme. You can almost smell the sweetness of the malt bill, which as I understand it, is prett-much dominated by Munich malt. The taste is quite sweet, but not cloyingly so. It’s quite “Bockish” with a strong malty presence and some nice mineral notes that seem to bolt everything in place. Again there’s a sizeable fruity note in there, but it’s not over-bearingly orangey. The sweetness, fruitiness and just a hint of bitter lingers on in the after-taste. I feel that this is very much a “dessert” sort of beer and would go well with something else. Cake maybe, oh hold on: Christmas cake or even Christmas pudding. What a good idea. XT6 is a fine dark ruby-red, vision of a beer; with a great big dark-malt surge up the nostrils and lively floral, slightly citrussy hop notes that poke out here and there. The after-taste is long and enduring and means you just can’t leave the pint alone…until it’s all gone and you want another one. I need to seek this beer out again when it’s colder outside, I’ve got nothing in particular to do and there’s a great big steak and ale pie in the oven.